The Chinese mobile gaming market has already surpassed the United States mobile gaming market in terms of both number of downloads and revenue size, which is making China mobile gaming more lucrative and most important market across the globe. With the growing number of Smartphone users in the country, development of free WiFi infrastructure has also contributed to the significant growth of the China mobile gaming market. As free WiFi is available in public transport and internet cafes more and more users (around 54%) are downloading mobile games via these free WiFi facilities. Goldstein Research analyst forecast the China Mobile Gaming Market to grow at a CAGR of 9.2% during the period 2016-2024. Further the market is likely to reach USD 12.4 billion by the end of forecast period. Moreover, the Global Mobile Gaming Market to grow at a CAGR of 5.4% during the period 2016-2024. 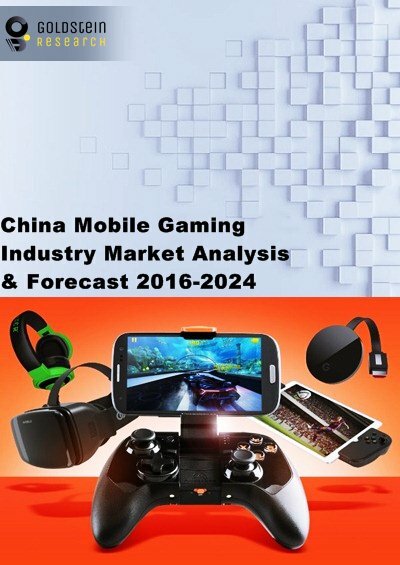 The report covers the present ground scenario and the future growth prospects of the China gaming mobile gaming market for 2016-2024 along with the total revenue generated by mobile games in every region. We calculated the market size and revenue share on the basis of revenue generated from the number of games downloaded and purchased by mobile users across the China. Based on operating systems, android operating system is the dominating segment, accounted for around 73% market share in China mobile gaming market. However, iOS operating system is doing well than in the number of devices with around 39% revenue share. China Mobile Gaming Market Outlook 2016-2024, has been prepared based on an in-depth market analysis from industry experts. The report covers the competitive landscape and current position of major players in the China mobile gaming market. The report also includes porter’s five force model, SWOT analysis, company profiling, business strategies of market players and their business models. China mobile gaming market report also recognizes value chain analysis to understand the cost differentiation to provide competitive advantage to the existing and new entry players. Our China mobile gaming market report comprises of the following companies as the key players in the market: Tencent, Netease, Duoyl, KingNet, Perfect World, Snail Games, Longtu Game, Youzu, Gameloft, Nintendo, supercell, Chong li, Happy Elements, Ourpalm, Momo Technology. According to our China mobile gaming market study on the basis of extensive primary and secondary research, one major trend in China mobile gaming market is emergence of virtual and augment reality technology. Mobile virtual reality games are very popular among Chinese consumers, which are augmented by the presence of affordable VR devices in the region. However, price-conscience Chinese consumers are more attracted toward the low price VR devices such as Google (Cardboard), Samsung (Gear) rather than the high end virtual reality devices provided by the Facebook (Oculus) and HTC (Vive). According to the report, major driver in China mobile gaming is growing number of gamers and online population across the China. In China there are approximately more than 440 million gamers in which 29% gamers like to spend money on online games and app purchase. Further, the report states that one challenge in China mobile game market is the government regulation which mandates the outside company to publish their games with a local partner, unlike the western countries where game developer can easily publish their games in the distribution channel without any hassles. Geographically, Tier-1 cities accounted for the highest revenue share of more than 35% in the China mobile game market as the number of gamers who purchase paid games or apps is higher in these cities. What is the total paid downloads and in-app purchase in 2015-16 and what would be the expected purchase and downloads over the forecast period?